Calling all free spirits and Harley-Davidson enthusiasts! 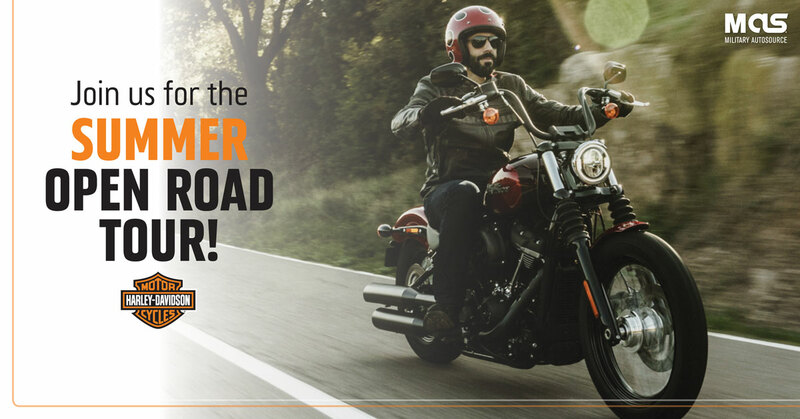 Military AutoSource and Harley-Davidson have partnered up to bring you the Summer Open Road Tour. Our Tour began in July and will continue all the way until December. Explore our lineup of Harley-Davidson models including the all-new Sport Glide! This is your chance to grab life by the handlebars and start your next adventure! Stop by for some old fashion family fun and come see what it is like to ride a real Harley-Davidson with the Harley-Davidson® JUMPSTART™ Rider Experience – combining a Harley-Davidson motorcycle and a specially-designed, stationary support stand. Ready to try it out? Stop by our next Summer Open Road Tour! Can’t wait? Want to price check the Harley-Davidson of your choice? No problem!